Pat Day is a four-time winner of the Eclipse Award for Outstanding Jockey and was inducted into the National Museum of Racing and Hall of Fame in 1991. Day has ridden winners of U.S. Triple Crown races nine times. Day is also the all-time leading rider at Churchill Downs and Keeneland Race Course, the two largest tracks in his adopted home state of Kentucky. In 1998, Awesome Again went undefeated. He won all six races he entered, in the process defeating Champions Silver Charm and Skip Away. He came from far back to win over one of the best-ever fields assembled in the 1998 Breeders' Cup Classic. 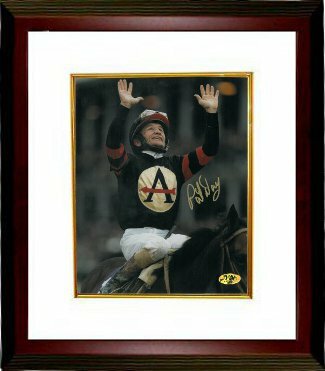 Pat Day has hand signed this 8X10 Photo from the 1998 Breeders' Cup aboard Awesome Again at Churchill Downs. MAB Celebrity Services Hologram and certificate of authenticity from Athlon Sports. Custom White Mat and Premium Mahogany Frame as shown.